Hi guys! TGIF! I don't really have too many plans for this weekend, but that's fine. I think I'll just rest tomorrow and then run some errands on Sunday. Quick question: does anyone have any recommendations for shows on Netflix or Amazon? I have 2 episodes of The Night Manager with Hugh Laurie and Tom Hiddleston left and then I'm out of shows. My husband says I should watch Riverdale, but I haven't started it. 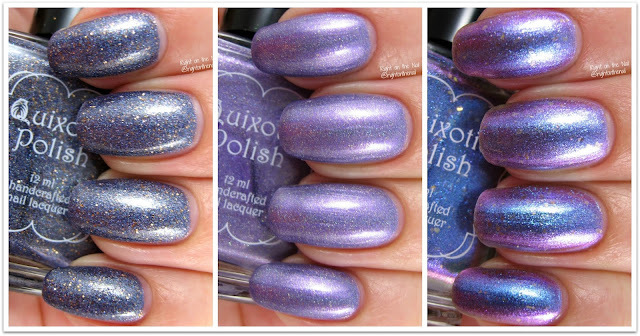 Unfortunately the trio I'm going to show you is a Quixotic Polish Facebook Fan Group exclusive, and it's no longer for sale. I'm telling you, you need to join the group for all of the exclusives and discounts. Mary just released a new trio inspired by Greek beaches so make sure to check those out while they're around. If you love purple, you're in for some beauties tonight. Man, it's so hard to decide which one is my favorite. Final Frontier slightly reminds me of Barielle's Falling Star and I specifically remember that polish because it's my favorite Barielle color. It's pretty much the contrasting copper glitter that reminds me of Falling Star because the base is really different. Anyway, Final Frontier is medium dusty blue microglitter with larger copper glitter. I've made up my mind, this one is my favorite! I used 3 coats for the swatches, and the formula was slightly thicker than I prefer, but I didn't need any thinner. If you like the thickness of Tonic's polishes, then you won't have any issues. I'd rather have a thicker polish than a thinner one because it's easier to add thinner than evaporate thin polishes. It's not a true trio without a good holo polish, right? Lavender Haze is a lavender base with a linear holo finish. You can even see the holo in my diffused light photos above which is impressive. This is 3 coats, and the formula wasn't too thick. Mineral Chrome is a multichrome that shifts from blue/purple/gold. You can only see the gold at extreme angles (i.e. the last photo). Like Inner Sparkle from Monday, this one has that luminescent feel to it. This is a sheerer color, so you should be able to use a coat or 2 over a base color to achieve the same result. I prefer to keep building until opacity, so I used 3 coats to cover my visible nail line. This one was also had a thicker formula, but I didn't have to use any thinner or anything. This trio was only available for a few days, hence not being able to show it before it went away. I always hate showing polishes you can't buy, but I still want you guys to get a feel for the brand and what they have to offer (you can also go in the group to see if you can find these available from someone). Stop by the Quixotic Polish website, Facebook page, Facebook Group, or Instagram pages to find out more.